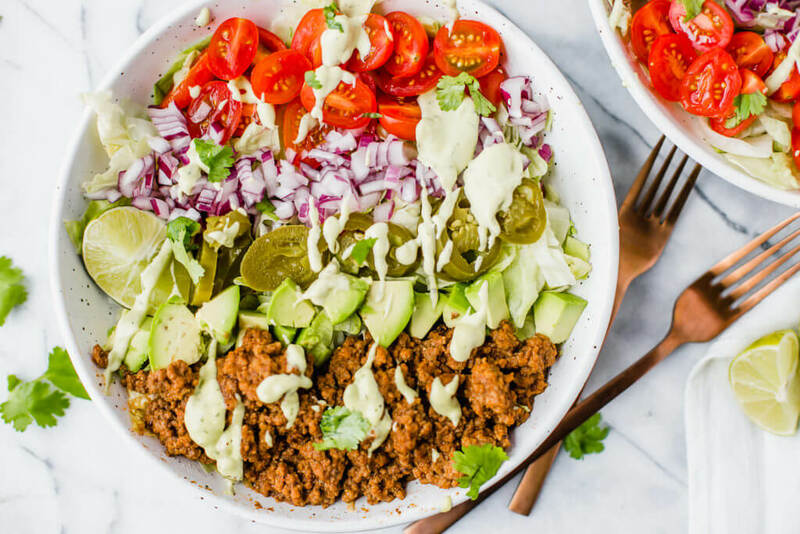 A quick and easy Taco Salad that is filled with savory ground beef, fresh veggies and drizzled with avocado ranch. 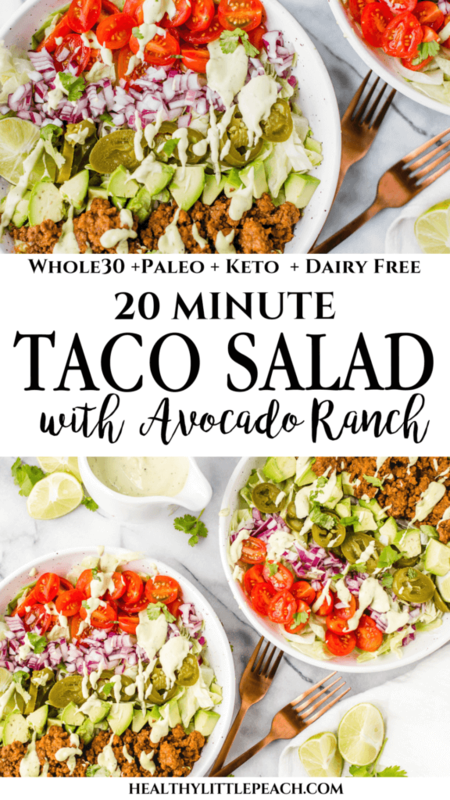 The whole family will love this Whole30, Paleo and Keto salad. I love the idea of having one night every week where meals stay the exact same. Not only does it simplify a busy life, but it also works wonders for a grocery budget. Right now we are on the kick of having Taco Salad Tuesday and we look forward to it every single week. To change things up, I will usually do consistent rotations monthly or for 4 weeks then change the theme so we don’t get burned out. In addition to keeping once a week consistent I also do that with leftovers. For example, if we have Taco Salad on Tuesdays then on Wednesday I will plan to take the leftover taco meat. I usually will recreate another meal and make taco bowls using cauliflower rice. It changes it up just enough to make me feel like I am eating something different 2 days in a row and it also saves money. My favorite part of this Taco Salad is the homemade taco seasoning that is better than any store-bought version. In my opinion, the key to making good taco meat is adding tomato sauce so that the seasoning can mix well with the hamburger meat. It makes it so moist and flavorful. I love this taco meat so much I can literally put it in a bowl and eat it all by itself without adding anything else. My Avocado Ranch recipe takes this dish to a whole new level. When making this dressing it is recommended to consume within a couple of days or it will start to turn brown due to the avocados. That’s why you should always plan for leftovers and use this for lunch the following day. I love when healthy can be both delicious and satisfying. This dish along with the dressing is Whole30, Keto and Paleo compliant which makes it even better. Who says healthy can’t be good? My mayo for my ranch won’t ever get thick…What am I doing wrong? Making mayo takes practice and once you get it to thicken you will feel so accomplished. The main key to making thick mayo for your ranch is using LIGHT olive oil or avocado oil along with a room temperature egg. Another tip when using an immersion blender, keep your blender over the top of the egg and count to 10 Mississippi..this is a fail proof way to get your mayo to thicken. Mayo can be made in a regular blender also. Simply add all ingredients except the olive oil and turn your blender on slow/medium speed and add in the olive oil slowly and blend until thick and creamy. If you are struggling to get your mayo thick, don’t give up, it takes practice. I prefer the immersion blender because it is quick and easy and can be made right in a mason jar. Removing mayo from a blender can be a bit of a headache. Is taco salad good for you? Not all taco salads are made equally. If you were to drive up to Taco Bell and get yourself a big taco salad in their crunch tortilla bowl, it might not be the healthiest option. However, if you were to make my Whole30 compliant recipe, I would 100% say that it is a great, healthy meal option that the whole family will love. How do you make your taco meat? I always use grass fed beef, usually from Butcher Box, my homemade taco seasoning along with a little tomato sauce. I have always added tomato sauce to my taco meat mixture so that it doesn’t dry out. I have also found that adding the tomato sauce allows the taco seasoning to mix evenly. Heat a skillet over medium heat, along with a tbsp of olive oil. Add the ground beef to the skillet and brown for about 7 minutes or until meat is cooked through. Add the tomato sauce along with taco seasoning to the beef. Allow to simmer on low heat for about 3 minutes. Clean and chop the onions, avocados, jalapenos, and grape tomatoes. Finally, add 2 cups of lettuce to each bowl and spoon the taco meat over each salad as desired. Divide the chopped veggies evenly among the 4 salads. Drizzle with the avocado ranch and top with fresh cilantro and enjoy! 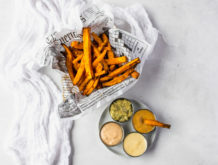 You can also use a regular blender for the mayo, add all ingredients except the olive oil and turn blender on medium speed and slowly add in the olive oil and mix slowly until thick. Add the rest of the ingredients for the avocado ranch to the mayo base and mix in a blender or using an immersion blender until creamy. Immersion blender- A MUST HAVE for making mayo and dressings.